I was trying out the content type hub amazingly for the first time the other day. I found some nice posts on how to configure it which was reasonably straight forward. Once I had created a content type in the hub I was able to publish it to another site collection successfully after running the "Content type hub" and appropriate "Content site subscriber" timer jobs. After this point I though I would try an update to the source content type. I changed the name and re-run the timer jobs. My subscribed content type name was not updated. It turns out that content types must be republished once they have been changed. This is available under the "Manage publishing for this content type" link. Once I had done this and re-run the services my subscribed content type updated making me feel much better about life in general. I was at Microsoft the other day talking to some of their PFEs regarding all things bright and SharePoint. The topic of search crawls came up. I received some information which I wasn't aware of which I thought I would log. As most of us are aware SharePoint Search can conduct a "Full crawl" and an "Incremental crawl". What most people do (myself included in the past) is schedule a full crawl late evening / early morning and schedule incremental crawls at regular intervals throughout the day. To be honest I'm not sure where this habit came from. I guess it just seems to make sense......except it doesn't. A scheduled Incremental crawl is sufficient for day to day crawling. There is no need and as far as MS have informed me, no advantage in running Full crawls on a regular basis. Full crawls are only required if a crawl rule or crawl property has been changed (there might be another couple of situations - but these are config changes). All changes are stored in a change database and this is what the incremental crawl looks at to see what it needs to update. The changes database automatically clears down so you don't need to worry about it getting too big. There is one caveat and that is that the change database does clear itself after a certain amount of time so you have to make sure you do your incremental crawl within this time. This period is in the region of 30 days so assuming that you are going to schedule incremental crawls more frequently than this you are ok. So, for day to day search indexing, only schedule incremental crawls. So I was wanting to know how to send documents to a record centre manually. Took me a little while to do the digging to find out were you configure the "Send to" links so I thought I would do a quick post to remind myself. Once on this page you can add a new send to connection for a specific web application. Once you have done this you are able to specify whether you need to copy, move or move the document leaving a stub in its place. I have always had a cold feeling when attempting to add dlls to the gac on Windows server 200. This post here sorted me out although I did have to steal gacutil from my dev machine. It also can be tough getting dlls from out of the GAC. This post hightlights the process for successfully copying all the dlls from the GAC into a specified folder. Very helpful when you have TFS With SharePoint WSS3.0 and for some reason content is referencing MOSS dlls.........the things we have to deal with hey. I was handed an issue whereby one of the SharePoint servers in a farm had fallen apart. For reasons I won’t go into now, this application server had been rolled back so that all that remained was a clean windows 2008 build. There was not a hint of SharePoint on this poor thing. The task was to reintroduce this server to the farm. This sounded straight forward at first but was made a little more complicated by the fact that central administration was on the machine which was lost so I was unable to make any farm alterations this way. The farm in had two web front ends and cluster sql boxes. The dead application server waited to join the farm. Back up existing farm settings and content - Log on one of the web server and Back up IIS websites, 12 hive and main site collections. Run SharePoint products and technologies configuration wizard – Run wizard on web server and configure to install central administration on this web server. Remove redundant server from farm – Navigate to central administration and remove the application server from the farm (via operations -> Servers in farm -> Remove server). This updates farm so that there is an accurate representation of server architecture. 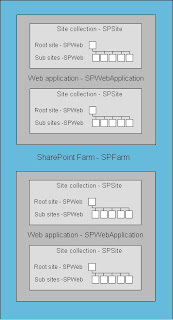 Install SharePoint on Application server and connect to farm - Log on to application server and Install SharePoint and connect to existing farm. Run SharePoint products and technologies configuration wizard – Run wizard on Application server and configure to install central administration on this application server. Hey presto, you have a central administration up and running again on the correct server. I required a back up of a production site collection today. I usually take backups OOH but for the task I was conducting I wanted a quick backup so that I could do a fast restore and run a few tests. The default stsadm backup operation (after service packs installed) will set the database to read only which is obviously not a good idea for production environments. Fortunately there is a switch which doesn't look the database which was exactly what was required in this case. 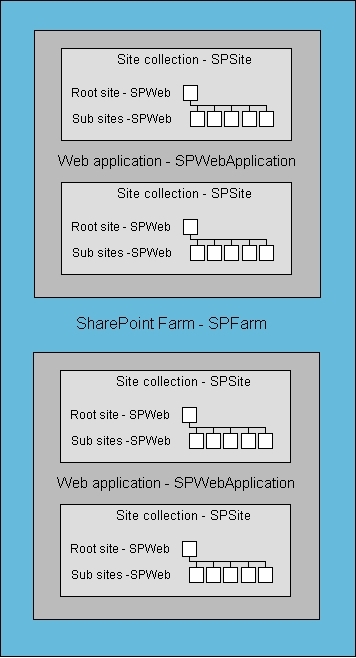 SPFarm / SPWebApplication / SPSite / SPWeb - Ever get confused? Finally I am starting to put something in this blog. Sometimes I refer to the following image when I havent been developing for a while to remind myself of the heirarchy of SharePoint objects. Perhaps some of you might find this useful for reference.